Tryon International Equestrian Center at Tryon Resort is one of the world’s premier equestrian lifestyle destinations and competition venues, and home to the 2018 FEI World Equestrian Games! 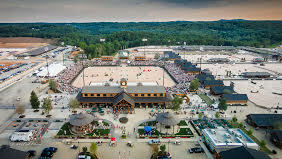 It is a spring, summer and fall haven for eastern and northeastern American equestrian competitors and enthusiasts, and a year-round destination for connoisseurs of diverse cuisine and family entertainment.The venue provides outstanding facilities for hunter/jumper, dressage, and eventing competitions. With onsite shops, dining, entertainment and plans for more, non-equestrian visitors are equally marveled by the Tryon Resort experience. This new facility opened in June 2014 with sanctioned horse shows and initial supporting amenities, and now boasts 12 riding arenas, 1,200 permanent stalls, and a variety of restaurants, shops, and lodging options, plus a sporting clay course and a golf and sports club. Future expansion includes a 180-room resort hotel, condos and apartments, additional mixed-used retail, visitor center, and sports complex. The General Store- With a focus on items born and bred in the Carolinas, the General Store at Tryon Resort is the perfect place to purchase a deli lunch, sundries for your cabin or a quick snack like hand-scooped ice cream or gourmet chocolates. Locally-sourced, organic meats, produce and dairy products are also available, as well as a huge selection of craft beer and local wine. Call 828-863-1000 or email info@tryon.com. Find us on Facebook at General Store Tryon Resort.